There’s a win, a draw and two losses to report in this week’s mixed bag of St Andrews Table Tennis Club’s fixtures – plus the sad tale of the New Kids’ regular chauffeur, Kong Wan, being car-less meaning the team had to throw themselves to the benevolence of Telstars to obtain a postponement for their away fixture in Dundee. The win came for Swots in their re-arranged Handicap Cup second round tie against Tigers. Five wins for Dave Beveridge, arguably enjoying his best form of the season, backed up by three from Rob Brown and two from Emma Bissett, make the 10-4 victory sound as if the handicappers erred on the generous side for Swots when, in fact, the team played with a freedom it has not been showing in its fight against relegation in recent weeks. A draw and a defeat was the story for Truants in a week when they played two ties. They took to the table against Chieftains without this season’s ‘main man’ Sascha Roschy. 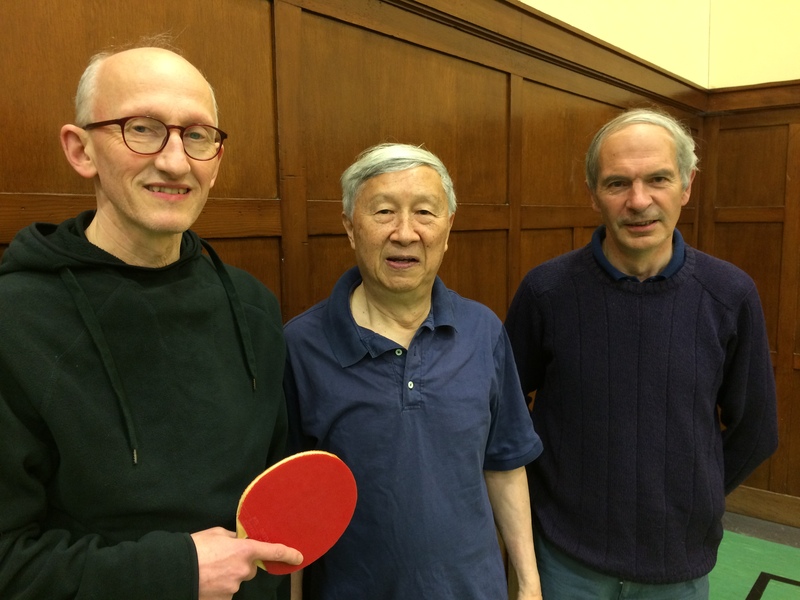 Alain Leger, Graham Wood and Knut Radmer each put a score on the board and it was a fixture of ‘what might have beens’ as they lost all four five-setters in their 3-7 defeat. Alain dropped out for the second fixture of the week against Telstars, with Sascha returning, but in the tight surroundings of the Telephone House venue and the wiley ways of the experienced Ian Farquhar, Sascha’s proud 100 per cent league record perished. However, two wins each from Sascha and Graham and one for Knut still meant Truants headed home with a 5-5 draw, although the shine was taken off the fixture by an injury sustained by Telstars’ popular Jim Houghton which may put him out for the rest of the season. Playing at home against Mylnefield’s Princes, Prospects found their opponents’ blend of youth and experience too much to handle on the night. Jon Fraser scored two wins and Fabio Sani added another single but Alfie and Andrew, the young pair of Princes, showed the sort of form which suggests that they may rule the game in Dundee in the not too distant future. This entry was posted in Match reports, St Andrews Table Tennis Club on February 24, 2017 by standrewstt. There was a full program of league matches for the five St Andrews table tennis teams this week but only one victory was recorded. In St Andrews on Monday, Prefects hosted league leaders Up4it who count Scotland No.1, Gillian Edwards, among their team. Michael Hahn squeezed two points out of the fixture for Prefects but Howard Lee and Sascha Roschy were unable to match his achievement. Sascha, moving up a league for the night, at least enjoyed the distinction of taking a game off the aforementioned Gillian. Final score 2-8. On the adjacent table, New Kids registered a precious three wins against a Chieftains team that might be knocking on the door of promotion by the end of the season. 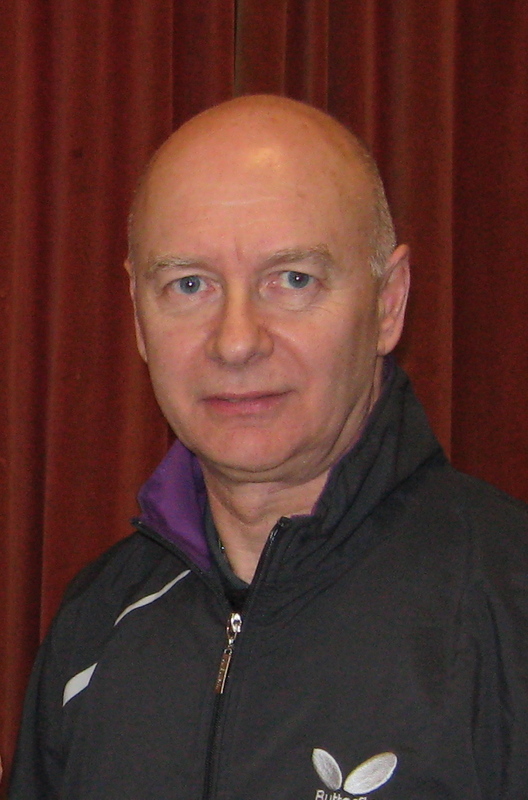 Ian Smith enjoyed singles wins over Jim Tawse and Fiona Kinloch. The contest with Fiona was a 5 game thriller with Ian fighting back from a 2-0 deficit and saving several match points in the process. Ian also partnered Kong Wan to an unexpected doubles win over the same two Chieftains. It was Andy Hughes, however, playing up the Mylnefield side who did most damage to New Kids with an undefeated hat-trick of singles wins. Final score 3-7. On Tuesday, the gloom lifted with a welcome 6-4 win for Truants in the squash courts at Lundin Links. There were a number of unlikely looking results in this contest. Knut Radmer scored impressive wins over Romann Nyfza and Arthur Duncan, while Sascha, more predictably, made up for Monday night with another second division hat-trick to keep his 100% average intact. Leading 5-4 going into the last match, it was Knut’s amazing performance against Arthur that secured the win for Truants. The pair shared the first two games but Knut must have had Arthur scratching his beard after taking the next two games for the loss of only 8 points. Final score 6-4. The heaviest defeat of the week was inflicted on Prospects at Ward Road Gym on Tuesday. Emily Howat, Dave Goddard and Neil Lea fought gamely against Squires and might have had at least two wins if they could have reversed the outcome of the five game contests. It didn’t happen though and the dreaded whitewash was confirmed with Tanya Kapelyukh’s 3-1 win over Dave in the last match. On Wednesday against Tigers, Swots continued their recent trend of not being able to get all three players firing on the same night. After losing the first two matches (the first being especially cruel on Emma Bissett who lost all three games despite winning 10 points or more in each one), Dave Beveridge got the St Andrews team back into the fixture with a comfortable straight games win over Logie Anderson. However, with Collin Bleak struggling to find his earlier season form it was match nine before Emma registered Swots’ second win with a tight 3-2 triumph, again over Logie. Collin regrouped, and for a while looked like causing damage to Scott Thomson in the last match of the night, but it wasn’t to be and Swots lost 2-8 to a strong Tigers line-up. The big cats returned home purring with delight. Our tough season was set aside however on Friday night when the club held its sixth annual dinner in a local Indian restaurant. 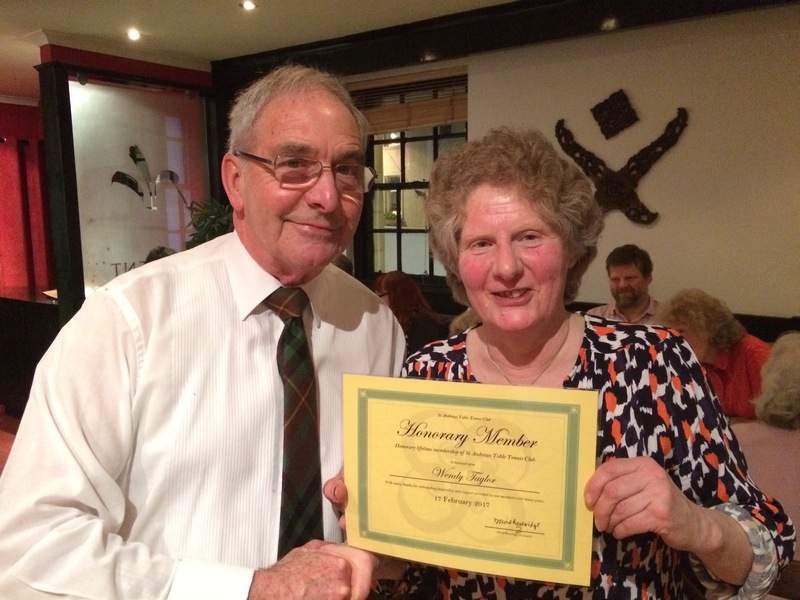 Outgoing Chairman, Neil Lea, was left speechless when Elaine Forbes presented him with a certificate of Honorary Membership for his partner, Wendy Taylor who was, unfortunately, unable to be present. Among other things Neil and Wendy have hosted club members for many years at their home in New Gilston on Sunday evenings for a game of table tennis and a famous spread of cakes and other irresistible comestibles provided by Wendy that accounts for many of our members’ growing waistlines. This entry was posted in Match reports, St Andrews Table Tennis Club on February 18, 2017 by standrewstt. There was a mixture of matches on the fixture list of St Andrews Table Tennis Club this week. Officially designated a cup week, it also provided the chance for both Prefects and Prospects to catch up on rearranged league matches. Prospects welcomed Forthill’s Sputniks to the Victory Memorial Hall on Monday night to fulfil a fixture originally scheduled for 2nd January, when other matters had been on the players’ minds! However, it turned out that Prospects’ focus must still have been elsewhere as only Fabio Sani managed a win, with a 1-9 scoreline in favour of the visitors. Prefects travelled over to Broughty Ferry on the same evening to play a catch up Division One fixture against Aces. Michael Hahn turned in his usual polished performance, only dropping a single set in his three wins. Howard Lee battled hard in all his ties, and was particularly unlucky to go down in four entertaining sets to Grant Williams. Sascha Roschy, stepping in as the third player, scored a good win over Peter Dixon (late of St Andrews parish) and lost a tight five setter to Grant. To return with four points was a respectable haul against higher-placed opposition. Swots’ eagerly anticipated Handicap Cup evening against fellow Division Two side Tigers turned into a damp squib when their opponents inadvertently stood them up, having confused the date of the tie. Good will on the part of Swots means that a new date has been found so that the tie can be played, rather than a walk-over claimed. Prefects also had a Handicap tie on their schedule with Michael making his second visit in three nights over to Forthill Sports Club, this time in the company of reserves Dave Beveridge and Emma Bissett. Were the St Andreans on fire or did the handicappers misjudge slightly? Michael, Emma and Dave will doubtless claim the former, as they scalped Defenders 10-1 to secure a place in the quarter finals. Truants’ run of good form in the Stanley Doubles was ended unceremoniously in the quarters when Graham Wood, Alain Leger and Sascha could do nothing to stop the overpowering attacking play of the Division One leaders. The Mylnefield side, no doubt with their Excelsior Cup final looming in their thoughts, were not in charitable mood and Knights put Truants to the sword 6-0. A goodly number of players from both our competitive teams and from the Thursday night recreational ‘Rascals’ will join together at a venue in St Andrews this Friday evening to do what we do best at the club dinner – eat, drink and talk about the matches that got away. This entry was posted in Match reports, St Andrews Table Tennis Club on February 12, 2017 by standrewstt. 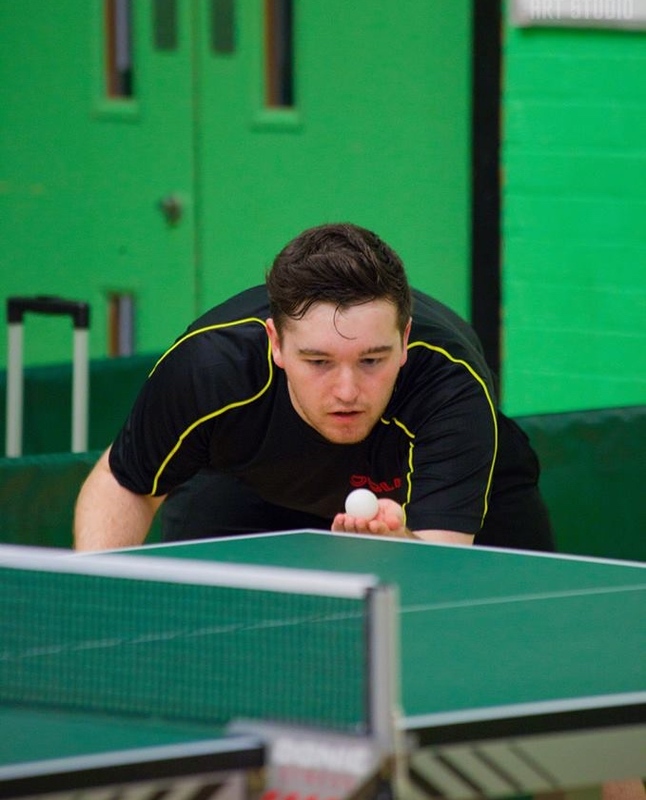 St Andrews Table Tennis Club’s Division Three side Prospects have had a busy week, playing one home match and one away match. At home on Monday night, they had a huge tussle with bottom team Telsports who were greatly strengthened by the presence of Graeme Elrick. By the time half the matches had been played, Prospects found themselves 1-4 down with Jon Fraser the only St Andrean to score a win. However, Emily Howat got the recovery underway by defeating Sandy Elrick, followed by a doubles win for Jon and Neil Lea. Jon drew Prospects back to 4-4 before they slipped behind again and it was left to Neil to secure the draw with a four set victory over Sandy. On Thursday night Jon and Neil were joined by Dave Goddard in making their longest trip of the season up to Brechin – a tale of second bottom in the division taking on second top. Carrying an injury picked up in obscure circumstances following the team debriefing after the Telsports match, Dave nevertheless used all his guile to come back dramatically in the first encounter. From 2-8 and then 6-10 down in the fifth game, Dave saved five match points to eventually come through 13-11. Things unravelled after that and only Jon was able to put another score on the card as the high-flying Brechin team sent Prospects homewards with a 2-8 defeat. In Division Two, it was also a case of a St Andrews team taking on table toppers in the shape of Telstars. Perhaps relaxing with few expectations on the evening, Swots made their opponents work hard, with only two of the ten matches being decided in straight sets. Emma Bissett scored an excellent win against Jim Houghton and was unlucky to be pipped 10-12 in the fifth by David Monteith but she had some consolation when, partnering Dave Beveridge, the Swots pair inflicted the first doubles defeat of the season on David and Ian Farquhar. With the fixtures among these three having been completed, relegation will be avoided by the team which can glean most points in the remaining fixtures against teams higher up the league. This entry was posted in Match reports, St Andrews Table Tennis Club on February 5, 2017 by standrewstt.